These Sumi-e artist brushes are made by the best brush makers in Japan. These brushes bear the Kumano Fude quality label and serial number proving their authenticity and quality. Artists, students and teachers will enjoy new found levels of Sumi-e skills as these brushes are discovered and employed. Each of these brushes are hand crafted by skilled brush makers and are of the highest quality. 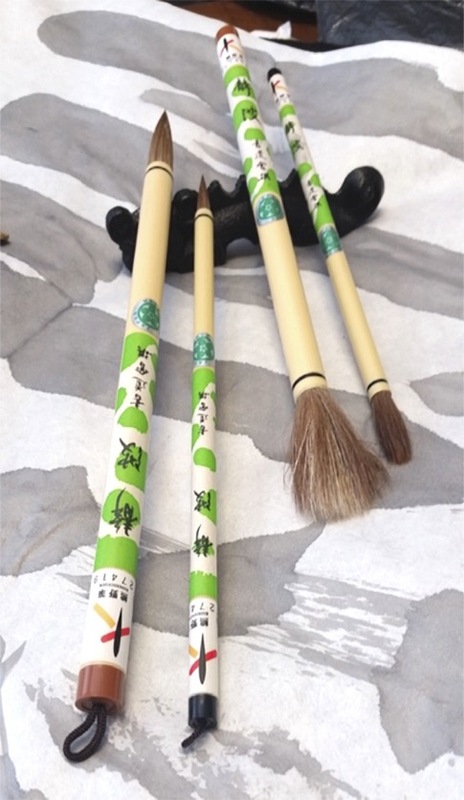 There are many types of brushes for Sumi-e and Calligraphy. Unlike Western brushes there aren’t a hundred types with one hair mixture. Each type is its own mixture and size depending on the usage. Calm Waves are mostly soft, made with 40% goat, 50% sheep, and 10% nylon. The brush is very resilient, with small size for control. It's a good choice for beginning Sumi-E.
Jade Waves are medium soft, made with 10% horse, 80% sheep, and 10% nylon. The brush keeps a good point and has an excellent body for landscape painting. Ocean White are the most stiff, made with 80% horse, 10% sheep, and 10% nylon. The brush comes in a convenient small size and is good for dry brush techniques and creating texture. Peaceful Wave has a medium feel, and is made with 40% horse, 50% sheep, and 10% nylon. This all-purpose brush has a strong body, and beginners will enjoy success with its wide range of uses. Young Moon is mostly stiff, and is made with 60% horse, 30% sheep, and 10% nylon. This all-purpose brush has a large body and is good for most strokes. New Leaves is medium stuff, and is made with 70% horse, 20% sheep, and 10% nylon. The long shape of this brush makes for bold strokes, and it is good for lettering and objects. Mountain Clouds is medium body, made with 40% horse, 50% sheep, and 10% nylon. This large brush makes long lines and has strong resilience.